August 1, 2017 – Springfield, MO – Brewer Science, Inc. invites visual artists to submit original art during the month of August for consideration in Pure Enjoyment, an eclectic exhibit of original art. The exhibit, sponsored by Brewer Science, will be held at the Creamery Arts Center, located at 411 N. Sherman Parkway, Springfield, MO, during the month of October. 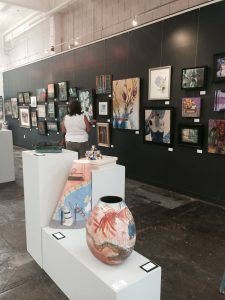 Artists interested in submitting their work for consideration must do so by August 31 in .jpg format; submission instructions and additional information can be found at http://www.brewerscience.com/art-show. Pure Enjoyment will include approximately 100 original works of art, including photography, mixed media, and dimensional art. Denene Taliaferro from Springfield, MO, has been chosen as the juror for this year’s exhibit. Selected artwork will be on display from October 6 through October 27, Monday through Friday from 9:00 AM to 5:00 PM, and Saturday from 10:00 AM to 4:00 PM. The public is invited to the opening reception, which will be a part of the First Friday Art Walk. The opening reception will be held at the Creamery Arts Center, located at 411 N. Sherman Parkway, Springfield, MO, on October 6 between the hours of 5:00 PM and 8:00 PM. For more information, please contact Leslie Forrester at the Springfield Regional Arts Council at (417) 862-2787 or Loretta Wallis at Brewer Science at (573) 364-0300, extension 1357.